AllegroMedical.com presents the Sharps-A-Gator™ Sharps Container, Chimney Top, Red, 4 Quart. Sharp Safety Monoject Sharps Container features chimney top entry and viewing windows on 4 sides with clear lid. Has extra wide butterfly closure and need removal notches. Can be autoclaved or incinerated. Can be autoclaved or incinerated. Clear lid with extra-wide butterfly closure. Translucent colors with lead-free pigments containing no heavy metals. Polished viewing windows on four sides. easy storage . simple to use. great price. holds a lot of syringes and needles was a lot bigger than i thought and was great on price also. For some reason I thought it was going to be smaller. It will take a while to reach the fill mark. I use this in a laboratory to dispose of syringes with needles. 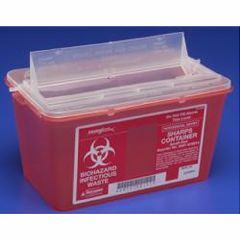 This is the lowest price I could find on similar sized sharps disposal containers. This works great for us, but the opening may be too small if you need to dispose of larger items.